Marshall White and his wife Cynthia White. FORT WAYNE—Visionary youth advocate, life coach and artist Marshall White was recently awarded the the prestigious Ian Rolland Courageous Leadership Award. White, founder and CEO of Unity Performing Arts Foundations, the umbrella organization of the world-renowned and world championship Voices of Unity youth choir, was recognized for his contributions to the youth of and people of this community at large. The award was presented to him at the 2017 My City Summit hosted by the Young Leaders of Northeast Indiana (YLNI). YLNI honored Ian Rolland, former chairman and CEO of Lincoln National Corporation, with the Courageous Leadership Award for his defining example of civic leadership by championing issues of equality and education in Fort Wayne. 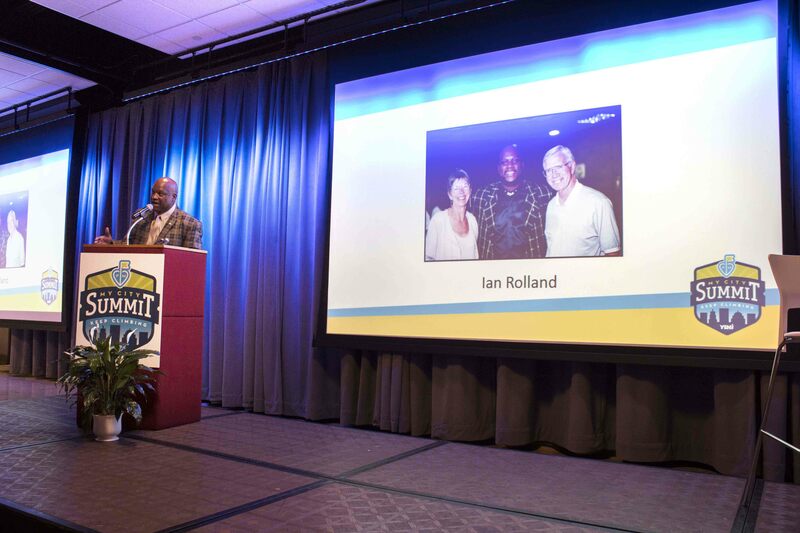 YLNI started the annual Ian Rolland Courageous Leadership Award in 2015 to recognize those who have followed in his footsteps by demonstrating a similar passion and integrity. White is a strong, focused and passionate leader. As his vision for the UNITY organization and the youth in this community continues to unfold, he is inspiring many and changing the world along the way. Again, the UNITY organization applauds his work and we stand by him as he continues to impact this generation. “I want to express my sincere appreciation and thanks to the Young Leaders of Northeast Indiana, for recognizing me with the Ian Rolland Courageous Leadership Award. I am truly humbled and honored to receive it,” said White in a statement. “My heart is extremely grateful to everyone in this community and abroad for your congratulatory comments and encouragement posted on social media, sent through emails and/or through your personal conversations. “I ask that the community continue to support the Voices of Unity Youth Choir members as they work to raise the bar in our community for youth. Your support, encouragement and investment in these young people will give them the fuel they need to continue to make us all proud.